Today I had fun at the Writers Plot & Readers Read Midwinter Book Festival. Writers Plot is a cool bookstore in Upper Hutt that only stocks books by kiwi authors They invited me to read some of my dragon books and bring along my dragon costume. Hannah and I had fun after the festival! Her twin sister Isobel was fun too, but those photos didn’t end up on my camera. Well, if I’m going to bring a dragon costume, why not wear it? More fun for Mia and Renae, a.k.a. fighting dragons. At the festival, we dived into the word of Dragons’ Realm —A You Say Which Way Adventure, where a dragonet sings off-tune, farts chocolate wrappers and pines for its mother! Of course that’s not the only story in Dragon’s Realm. In this book, You Say Which Way the story goes, so you can discover all sorts of adventures in one book —22 to be exact. Of course, the kids got to choose at every decision point and my lovely assistant (dressed in the kid’s dragon costume) awarded them with blood stains or medals for their efforts. It was loads of fun, with kids joining in and even teenagers eye-rolling at all the manure jokes! These kids chose a long and involved story with lots of action, adventure and opportunities to ride (you guessed it) dragons! After the festival was over, we had the chance to snap a few photos and enjoy cos-playing dragon attacks! My books flew off the sales table! 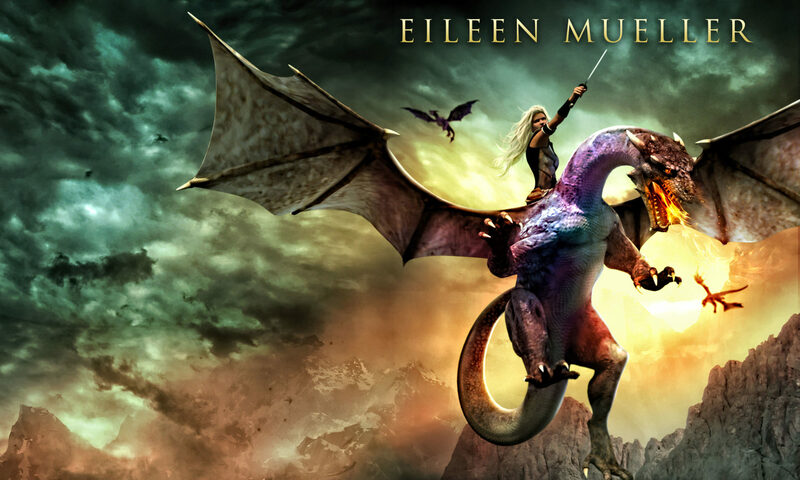 Everyone loves dragons — and adventure. With four dragon books to choose from, there was something to suit all types of reader — pulse-pounding adventure and plenty of laughs with Attack on Dragons’ Realm and Dragons’ Realm; fun and frolics with Dragon Tales; laughs with Fangtastic Dragon Jokes & Clawsome Limericks; and interactive fiction with Mystic Portal and Dragons’ Realm. Ben Spies, a young author, has a dragon fight with his brother Daniel. I was thrilled to meet Ben Spies, who wrote his first novel, Weirdo, at nine years old, and his next The Magic Pencil at ten! Ben is now twelve and still writing up a storm. The kids in his workshop loved his book and enjoyed his insights. It’s inspiring for them to see someone so young and already published! A big shout out to Writers Plot owners, Cat and Caro, for doing such a great job. It’s well worth a trip to Upper Hutt to see their great selection of kiwi books for kids, teens and adults. They also have an online store, so if you’d like one of my paperbacks, you can shop here, or contact me here. Ben Spies, a young author, and his brother enjoyed being dragons for a change. The Big Book Bash is coming up! The Big Book Bash is a book festival for kids and teens , featuring many Wellington and Wairarapa children’s and Young Adult (YA) authors. It’s all happening this weekend on December 2nd in Carterton. There’s fabulous line-up of well-known NZ authors, music, workshops and a carnival atmosphere. Libraries, schools, newspapers & radio stations are talking about it, the local book community is excited, and it’s going to be fun. In my workshop, You Say Which Way – Create a Sci-Fi or Fantasy Story, I’ll be taking youth on an adventure in the world of interactive fiction. We’ll journey through exciting worlds, making choices that shape the reader’s experience. They’ll start a science fiction or fantasy adventure of their own. Register here via Carterton library (in the right side menu bar). A storytelling finale with Marama Fox. I was absolutely thrilled – and more than a little speechless – to receive a 2017 Sir Julius Vogel Award for Best New Talent at Lexicon, the New Zealand Science Fiction and Fantasy National convention. The full 2017 SJV awards list is here. With the deep blue backdrop of Lake Taupo, and snow-tipped ranges across the water, the setting for Lexicon was magical. Ninety teenage writers attended workshops on Friday and boggled us with their talent. A weekend full of interesting panels, discussions, impromptu meetups with writers and fun social activities kept me on my toes. Not to mention the last-minute accommodation booking I made without realizing my bed was situated above a nightclub. It was actually above a nightclub AND three bars, the only nightlife in Taupo!! Yes, I was dancing all night – even in my asleep. Even though I was on the shortlist, it was still a nerve-wracking process waiting through the ballot and having that envelope opened on stage in front of my eyes. Then there was that long moment: sitting, stunned, while people nudged me to get to my feet! Thank you to my wonderful readers for nominating me. And thank you to everyone who has supported my writing – by beta reading, believing in me, critiquing my work and brainstorming plot fixes. Thanks to my publishers, The Fairytale Factory and Phantom Feather Press, they’re great! I’d also like to thank the New Zealand speculative fiction community, Romance Writers New Zealand and Holly Lisle’s online writing community. My critique groups deserve a proper mention. I’m lucky, I have two. Monkey Lab: Alicia Ponder, Charlotte Kieft, Michelle Child and Peter Friend; & Clarke’s Critters: Lee Murray, Simon Fogarty and Alicia Ponder. Everyone needs a tribe, so thanks for being mine. You’re all more than critique partners, you’re wonderful friends. I’m taking my Pet Dragons to Au Contraire! … after all I’d love to have more dragonets come to visit soon and there won’t be space if this lot don’t find happy readers to love them. Putting the dragons among the dragonflies! It’s going to be a busy weekend. I’m in a team, teaching a young writers all day on Friday, then we’ll be at the floating market fostering my babies (sniff sniff), workshop-ing with Anna MacKenzie on Saturday, listening to Juliet Marillier on Saturday, discussing forensics with police, community with fans and writers, and interviewing panelists about independent publishing until 10pm at night. Au Contraire is a not-for-profit event which supports New Zealand Sci-fi and Fantasy. All proceeds go to charity. The timetable is here. I’m absolutely thrilled to announce that I’ve had a story accepted for At The Edge, a dark speculative fiction anthology being released in the middle of 2016. My story Call of the Sea explores some dark themes, indeed – abandonment, rejection, grief and insanity, but be warned, I like happy endings. There were a truckload of submissions. The award-winning editors, Lee Murray and Dan Rabarts, said they had enough quality stories to make two great collections, but are only making one at this stage. The anthology will be published by Paper Road Press and launched at Au Contraire, the NZ science fiction fantasy convention, in Wellington this June. The cover artist for At the Edge is Kapiti-based Emma Weakley. It should be a great volume. I’ll keep you posted. Are you passionate about helping kids read? Would you like to make a difference to children’s literacy? Do you enjoy having fun? We have 6 weeks until Family Day and need your help! Storylines Free Family Days help kids meet New Zealand authors and illustrators and have fun with books. Crafts, live performances, face-painting, competitions, and activities help kiwi books come to life for kiwi kids. Join us as a volunteer – we need you. Encounter weird and wild creatures! Run amok with aliens and astronauts! Fling medieval insults & create medieval stories! Meet ‘Monkey Boy’ and help kids cook creatively! Fish up something from beneath the surface in the underwater corner. Design dragons, pigs, sea creatures and aliens! Dare to dress up! Shape-shifters welcome! Cool costumes rewarded! Get fishy with marine biologists from NIWA and Te Papa! Go out of this world with Space Place from Carter Observatory! 2014: Findlay reads Best Mates by Philippa Werry. In the War Zone, Kids tried on NZ Defence Force gear, got camouflage paint, met soldiers, ate Anzac biscuits, made poppies and medals, viewed the war gallery photos, met author Philippa, and saw Bob Kerr in action, illustrating. Over 4,000 Wellingtonians attended Family Day in 2014! This year we are at Shed 6, on Wellington waterfront, next to the TSB Arena on Sunday 23 August 2015 from 10am – 3pm. Don’t miss the opportunity to be a part of this special rewarding day. For more information, or to join our volunteer team, contact me now! Storylines Wellington Free Family Day needs You! Are you passionate about helping kids read? Would you like to make a difference to children’s literacy? Do you enjoy having fun? Help kids unlock the meaning in books and bring their reading experiences to life — join our committee to plan Wellington’s Storylines Free Family Day. We’re seeking one more committee member and many volunteers to help on the day. Crafts, live performances, storytelling, face-painting, competitions and other fun activities are an essential part of our festival, highlighting New Zealand authors, illustrators and books. If you’d like to help, please contact me. In 2015 4,000 Wellingtonians attended Family Day in Wellington. Let’s make it a great experience for them again this year! Please share this with your networks via email and social media. I look forward to hearing from you and having fun at Storylines Family Day together! 4,000 visitors flooded to Storylines Free Family Day in Wellington last month. The family-friendly event focusing on NZ kids’ literature was opened by Her Worship Mayor Wade-Brown and Dame Joy Cowley – both known lovingly by Wellingtonians as Celia and Joy. While preparing to cut the ceremonial ribbons, Joy heard one child asking whether Celia was the Queen. It was certainly a moment of pomp and ceremony! Once the ribbons were cut, Joy and Celia headed up to the Scholastic Books Out Aloud area to enjoy Celia’s rendition of Joy’s book, The Fierce Little Woman and the Wicked Pirate. After reading, Joy signed books for hundreds of her fans, young and old – who queued at The Children’s Bookshop stand to have a chat with her about her work. If you’re a fan of Joy Cowley’s work, you may want to check out this link to an exciting new anthology including one of her stories. Scholastic NZ Ltd made the day with Clifford the Big Red Dog, who, although not a kiwi icon, was loved by children of all ages. The teenagers who volunteered to bring Clifford to life said they had the best job of the day. There’s already a queue to audition for the role of Clifford next year! Storylines Free Family Day in Wellington included many exciting events in the Monster Fun Zone, Antarctica Zone, Bugs ‘N Bees Zone, and War Zone, as well as interactive activities with authors, illustrators and storytellers. We’ll feature more posts about Storylines Family Day soon, so stay tuned. That link for the anthology featuring Joy Cowley is here. For now, goodbye from me, and from Clifford! Storylines Family Day makes the Dominion Post! The Dominion Post ran a fantastic article about Storylines Family Day in their Capital Day page this morning. Joy Cowley mentions how Storylines Family Days “give children a love of reading.” At Free Family Days we open the world of stories and knowledge to them through providing stimulating activities based on books. WIN A COPY OF JOY’S NOVELS SPEED OF LIGHT & DUNGER. Gheko Press are giving away copies of Joy’s two novels Dunger and Speed of Light, via the Dominion Post Capital Day Page. Just email capdaycomp@dompost.co.nz with “Joy Cowley” in the subject line by 5pm Saturday 23 August. Good Luck. I’ve read Speed of Light and it’s a fantastic journey! Just when I was sure everything was going to fall apart in Jeff’s life with no hope of recovery… well, I don’t want to spoil the book, but the ending left me with a pleasant glow. If you don’t win a copy, you can always pick one up at Storylines Family Day tomorrow. If you get there before noon, Joy may have time to sign it for you. Julia Marshall, Director Gheko Press, with Joy Cowley and Paul Beavis. Shackleton Bear Goes South . Well, he’s actually come north, all the way from Christchurch to be with us for Storylines Family Day in Wellington! Author John McCrystal has gone all out to bring you a wonderful Antarctica Zone for Storylines Family Day. We’ve collected samples of marine life from NIWA, real stuffed penguins from Te Papa, oodles of slides, photos and pictures, a real snow tent from Antarctica NZ, and a replica of the old stove from Shackleton’s hut in South pole. Of course, Shackleton bear will be very happy to meet you! Visit him in our version of Shackleton’s hut! Come along and make snowflakes, snow globes, and bear masks! Meet Shackleton, see John’s presentation about going to the Antarctic with Shackleton Bear and try on a real Antarctic snow suit! We also have a Monster Fun zone, a Bugs ‘N Bees Zone, a War Zone, and more fun.